India should not be used by anyone as a launch pad for sea voyage to Australia! I am perturbed with some commentary whereby some people including Senator Sarah Hanson-Young are casting indirect aspersion on how India treats refugees. (http://tinyurl.com/k239hsr) Points are being made that India is not a signatory county to UN Refugees Convention. Some of them have mentioned even terrorist group ISIS (Islamic State of Iraq and A-Sham) in the same paragraph. ISIS executes people in cold-blood, and is hurting and subjugating people from religions other than their Sunni sect of Islam. This, even indirect aspersion, is inappropriate and offensive. India is not ISIS and can not even be remotely equated with it. India is a vibrant and the biggest democracy of the world. It has rule of law with free judiciary and totally free media. It has refugees from Sri Lanka, Burma, Bangladesh, China and many other countries. It has a proud and long history of welcoming persecuted people from all corners of the world. Parsis (Zoroastrians) left Persia because they were persecuted. Dalai Lama and thousands of Tibetans exiles have lived in India for several decades without any persecution or troubles. India treats refugees humanly and with care. India may not be a signatory to UN Refugees convention, but its treatment of those who claim refuge is exemplary. UNHCR (United Nation’s High Commission for Refugees) itself has said this about India many times. India lets UNHCR do the assessment about people’s refugee status, which is fair, appropriate and prudent. Raising concerns about India’s credentials as a caring society is objectionable. Coming to the current issue of 157 boat people (all likely to be Sri Lankan Tamils) who were intercepted by Australian Navy just outside its Maritime zone about a month ago, it is clear that the Boat has come from Indian Shores. From all the information, it is clear that they are all Sri Lankan Tamils, who were in a refugee camp near Pondicherry, South India. India is affected in multiple ways and is a concerned party. Its shores were used as the launching pad for this boat to Australia. India needs to know who these people are and how did they use Indian shores for launching the voyage to Australia. It is a security issue for India. India has an ongoing issue with Pakistan, from where terrorists enter Indian territories to perpetrate terrorist attacks in India. I am not saying that the boat in question is carrying terrorists, but not being concerned and alarmed with this type of voyage will render India a hypocrite. India has a right to figure out who these people are and what is the exact composition of these people. Australia and India are friendly countries, and have strategic relations. I am pleased that Australian Minister for Immigration & Border Control, Scott Morrison, visited India recently and had a discussion with Indian Foreign Affairs Minister, Smt Sushma Swaraj. He was able to get an undertaking from Indian Govt that it will take back these people if they are Indian citizens and residents. That is a huge achievement for Australia. India will not, and should not, allow its territories to be used as the launch pad for things which are against any other nation. In this case, it is the stated policy of Australia that they do not want to entertain illegal maritime arrivals. 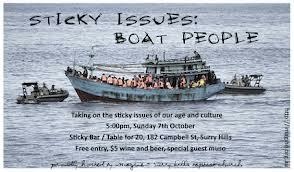 Current Federal Govt took the policy of “Stop the boats” to people during 2013 election and received a mandate. Previous Govt led by Julia Gillard/Kevin Rudd too had this policy. Offshore processing of illegal maritime arrivals has been the policy of Govts of both political persuasions. Australia can not afford to have the repetition of 5000 people arriving every month, claiming refugee status. We do not have the money to afford their accommodation, food, health and education. Our national Budget is in deficit and our economy is in stress. We have to look after our elderly, homeless and less fortunate people first. We have to look after our disadvantaged people first. Australia should accept its fair share of refugees, but there is no way it can afford an unlimited number of people who want to come to our shores with refugee claim. Australia is a caring and generous society, but there is a limit to it. I am concerned that some people decide to come to Australia from countries where they were not facing persecution. India is definitely one such country. There is no persecution programme for anyone in India. Indians generally, free Indian media and independent judiciary will not let this happen either. About the people in the Boat, who have now been brought to Curtin Detention Centre, I am not sure that they faced any persecution in India. Based on the prevalent governance and political system, it is unlikely they faced any persecution in India. They were living in the area ie Tamil Nadu, which is the homeland of Tamils in India. This fact alone makes it likely that they are economic refugees, not genuine refugees. If there is any Indian national in this group of people, then they should be sent back to India without any delay, because their claim for refugee status will be bogus, preposterous and baseless. Australia has all the rights to refuse to accept economic refugees. Australia has all the sovereign rights to control flow of illegal maritime arrivals. Australia in fact has an undeniable responsibility to look after its disadvantaged people before allocating billions on people who are not Australia’s primary responsibility. I see no problem in Australia working with India to figure out who these people are, where they have come from and why have they come to our shores in this manner. Australia has full rights to send them to the country from where they have come from if they are not genuine refugees. Australia has a well-stated and bipartisan policy of offshore processing and not settling illegal maritime arrivals in Australia. 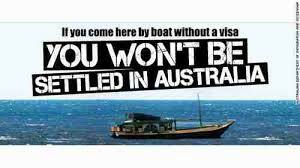 Australia does not encourage illegal maritime arrivals. It has been working with nations in the region to stop the illegal maritime arrivals. This is the first boat which has been allowed to land on our shores in over 7 months, presumably to allow sufficient time to Indian officials to process information and cross-check it. Australia is within its rights to work with nations in our region to achieve the stated policy goals. I am in full support of these goals. I know many others, in fact a majority of Australians, are in support of these goals. Finally, India should not allow anyone, under any circumstance, to use its shores or territories as a launch pad for voyage as “illegal maritime arrival” to Australia or any other country! Finally, Amitabh Bachchan accepts the Honorary Doctorate from Queensland University of Technology! We remember very well that Bollywood super star, Amitabh Bachchan had declined to accept the Honorary Doctorate from Queensland University of Technology [QUT] in 2009, when students’ unrest was at its peak in Australia. At that time, a segment of Indian media was running a campaign, calling each and every incident involving Indian students a racist attack. Living in Australia, we knew that “racism” was not the sole motive or the reason for those attacks. We tried to counter the vicious campaign by Indian media but had only limited success. Hearing about the news that Amitabh Ji had declined to accept the Doctorate, we made an appeal to him to visit Australia, accept the Doctorate, and see for himself that Australia is not a bad country, unlike the image Indian media had created. That did not work either. We are pleased that he has now accepted the Doctorate and is travelling to Brisbane to receive it on 20th October, 2011. He is currently in Sydney, shooting for the Hollywood film, The Great Gatsby [directed by Baz Luhrmann], which also has Leonardo Di Caprio, Tobey Maguire and Joel Egerton in the starring roles. Amitabh Ji, congrats for the honour! I did not think he was right to reject that honour then, but there was nothing anybody could do, due to madness in Indian media. He has obviously analysed everything now, and agreed to accept the honour. Happy to see this happen, and say “Der Ayad Durust Ayad”! [देर आयद दुरुस्त आयद <===> BETTER LATE THAN NEVER]. Amit Ji, please enjoy your stay in Australia, and enjoy this beautiful country! I am certain that you would find Australia a great place, and Australians to be friendly people. You have a great number of fans in Sydney, who would love to meet you, before you return to India. Hope, you will find time to meet them. Mahatma Gandhi in University of NSW [UNSW], Sydney:a proud moment for India and Indian Australians. I was a witness to a great and proud moment which happened in University of New South Wales [UNSW], Sydney today. 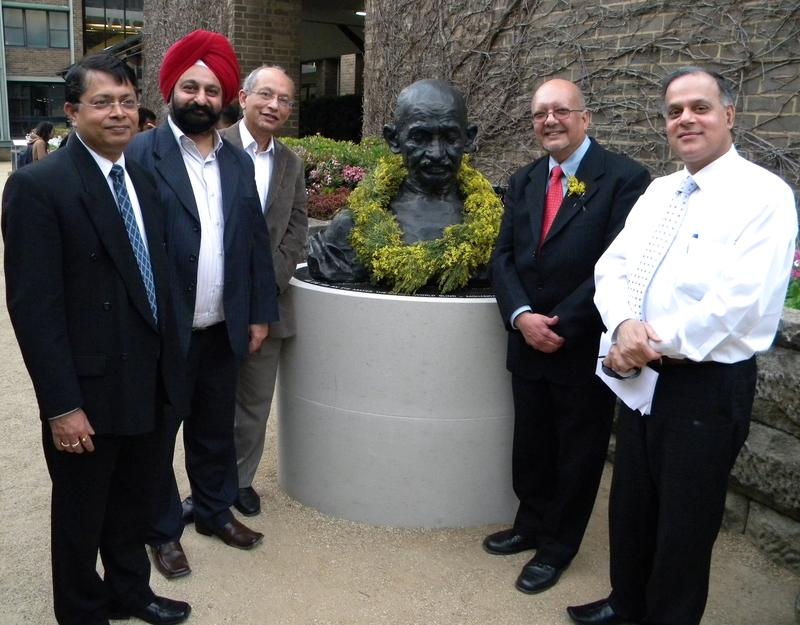 NSW Minister, The Hon Eric Roozendaal MLC, UNSW VC, Professor Frederick G Hilmer AO, and Indian Consul General, Mr Amit Dasgupta inaugurated a bust of Mahatma Gandhi. It is situated in the grounds in front of the UNSW library. Speeches were made on the relevance of Mahatma Gandhi’s teachings. He was described as a man of peace, non-violence and wisdom. Two quotes which I liked most go like “An eye for an eye will render the world blind” and “Be the change you want to see in the world”. In a grand yet simple ceremony, three students from Indian community were also awarded for their achievements in UNSW. I remember vividly that Mr Gambhir Watts of Bhavan Australia has been working on a project to get Gandhi Ji’s statue in Sydney for a while but this project achieved a significant momentum after our energetic and “can do” Consul General, Mr Dasgupta joined the Indian Consulate in march last year. Thanks and gratitude is owed to both these gentlemen. Mr Dasgupta has indeed made us proud. CG spoke about his visit to UNSW last year when Indian students’ issues were at its peak. He had a very productive discussion with UNSW. It was then that a decision was made to install The Gandhi bust in UNSW. CG had also donated hundreds of books on Mahatma Gandhi and India to UNSW library as gifts from India and people of India. CG, Mr Dasgupta was praised for his work in this regards. Apart from the Minister, CG and UNSW VC, this ceremony was also attended by other UNSW officials, Gambhir Watts, AIBC chairman [Mr Dipen Rughani], Harry Walia, Abbas Alvi, Nihal Agar, Rohitas Batta, Aruna Chandrala, Raj Datta, Neville Roach, Mrs Roach, Mala Mehta, N Saha, myself and many others. Media was represented by Pawan Luthra [Indian Link], Aparna Vats [Voice of India] and Harmohan Walia [Hindi Gaurav]. It was a very pleasant atmosphere with beautiful music, drinks and finger food which were served after the inauguration. This venue should become an important place for occasions like Gandhi Jayanti [Birth day celebration] on 2nd October. Inauguration of Gandhi Ji’s Bust should remind people about the principles and achievements of this great soul. It should also remind people that results can be achieved without violence, a message the whole world needs to listen more often today than any other time. I can’t describe how proud I was today.